Equine mascots are also popular with Royal Air Force units. Sgt Sparky McDougall was the mascot for 1 Radio School, RAF Locking during the late 1980s. He was named after the tradition of referring to RAF Radio Operators as Sparky or Sparks. He would be seen on parade alongside the human personnel of 1 Radio School. Sparky's tack now forms part of the Royal Air Force Museum's collection. 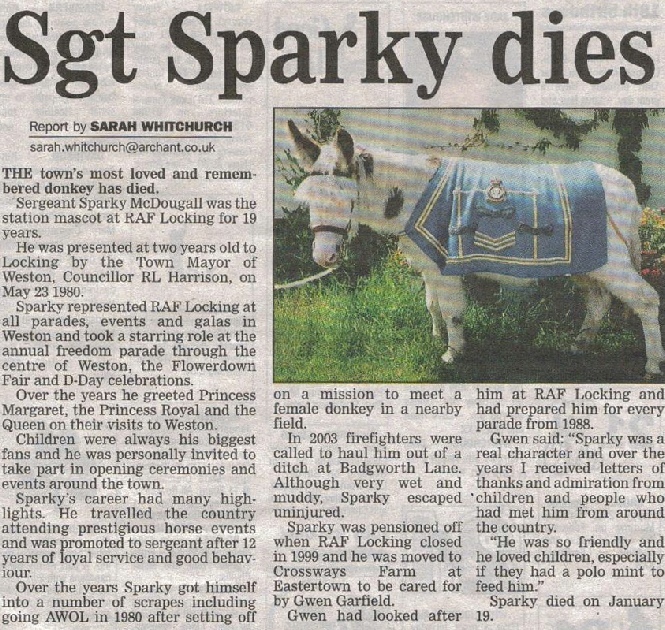 The town's most loved and remembered donkey has died. Sergeant Sparky McDougall was the station mascot at RAF Locking for 19 years. He was presented at two years old to Locking by the Town Mayor of Weston, Councillor RL Harrison, on May 23 1980. Sparky represented RAF Locking at all parades, events and galas in Weston and took a starring role at the annual freedom parade through the centre of Weston, the Flowerdown Fair and D-Day celebrations. Over the years he greeted Princess Margaret, Princess Royal and the Queen on their visits to Weston. Children were always his biggest fan and he was personally invited to take part in opening ceremonies and events around the town. Sparky's career had many highlights. He travelled the country attending prestigious horse events and was promoted to sergeant after 12 years of loyal service and good behaviour. 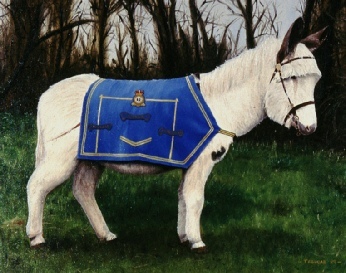 Over the years Sparky got himself into a number of scrapes including going AWOL in 1980 after setting off on a mission to meet a female donkey in a nearby field. In 2003 firefighters were called to haul him out of a ditch at Badgworth Lane. Although very wet and muddy, Sparkly escaped uninjured. Sparky was pensioned off when RAF Locking closed in 1999 and he was moved to Crossways Farm at Eastertown to be cared for by Gwen Garfield. Gwen had looked after him at RAF Locking and had prepared him for every parade from 1988. Gwen said: "Sparky was a real character and over the years I received letters of thanks and admiration from children and people who had met him from around the country. He was so friendly and he loved children, especially if they had a polo mint to feed him." Sparky died on January 19. Sgt Sparky MacDougal was the RAF Station Mascot from 23 May 1980 until the station closed 1999. The articles below tell his story.